A couple weeks ago I shared my wood heart cake toppers, which was first project using adhesive wood sheets. 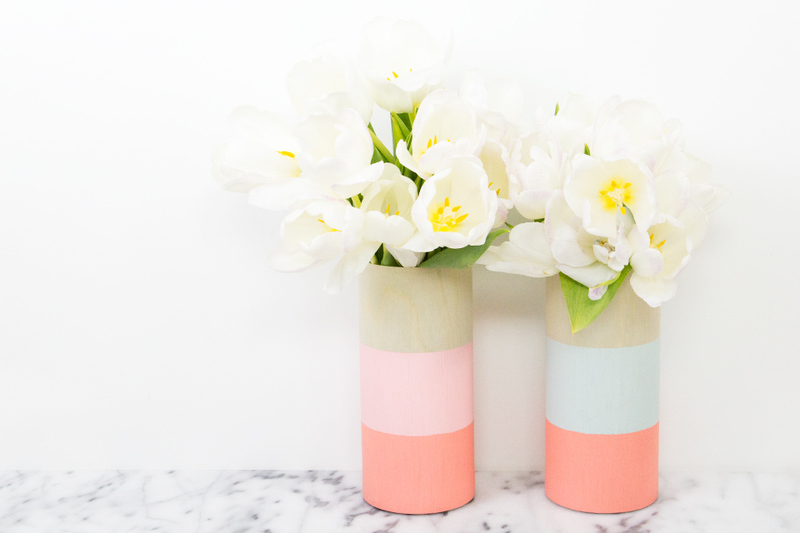 Today I’ve got another project that uses the same wood sheets to create gorgeous vases. This project can be done in about an hour and makes it so easy to create something that looks high end and not so handmade. Win, win, right? 1. Cut the wood sheet to fit the height and circumference of your vase. Don’t worry, you don’t need middle school geometry to figure this out. Just wrap the sheet around the vase (don’t remove the paper backing) and mark where it overlaps about half an inch. Then cut it down. Do the same thing to determine the height but mark it at the top edge of the vase. 2. Paint the bottom part of the sheet. Place the wood sheet flat on the table with a larger scrap sheet of paper underneath. 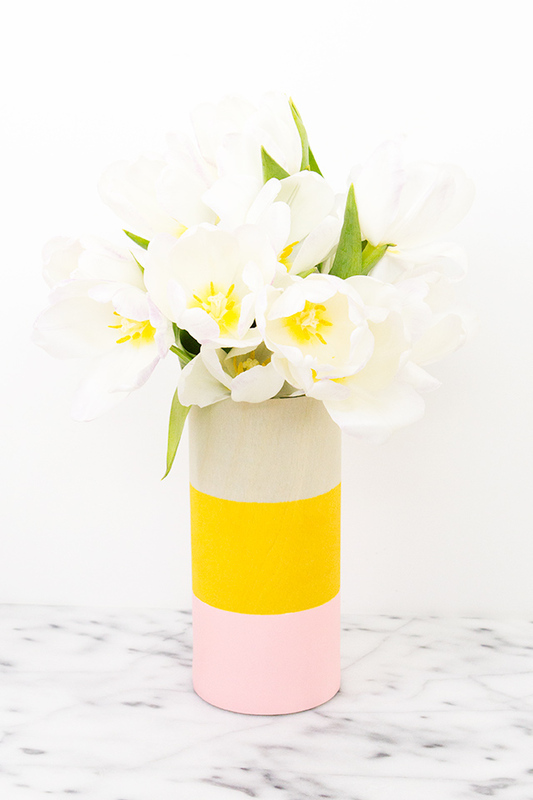 Use painter’s tape to tape off the bottom third of the vase. Paint the bottom part with craft paint making sure to paint away from the edge of the tape so it doesn’t bleed through. 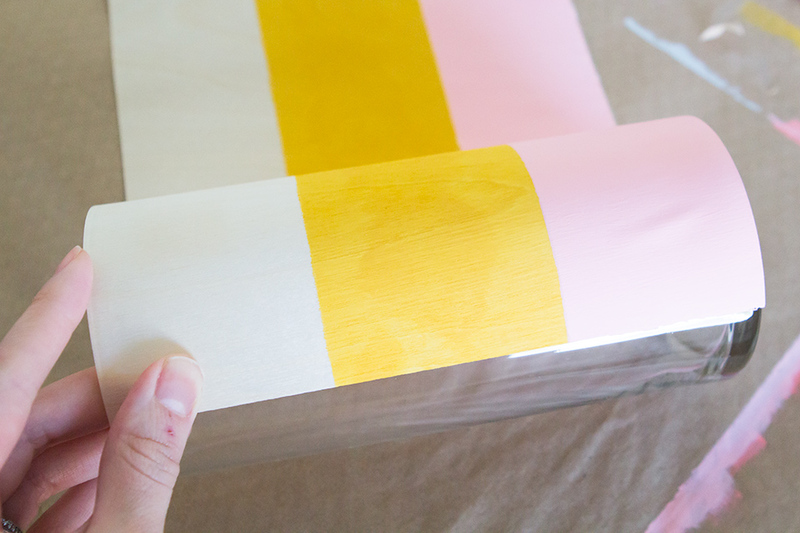 Allow for the paint to dry completely then remove the tape. 3. Repeat the same thing for the second color. This time you’ll tape off both the top and bottom lines. Paint this with another color and allow it to dry completely. 4. Remove the paper backing and stick the wood sheet onto the vase. Use your fingers to align the top and bottom edges. This can be a bit tricky but I found it easiest to work with when I only removed a little bit of the paper backing at a time. 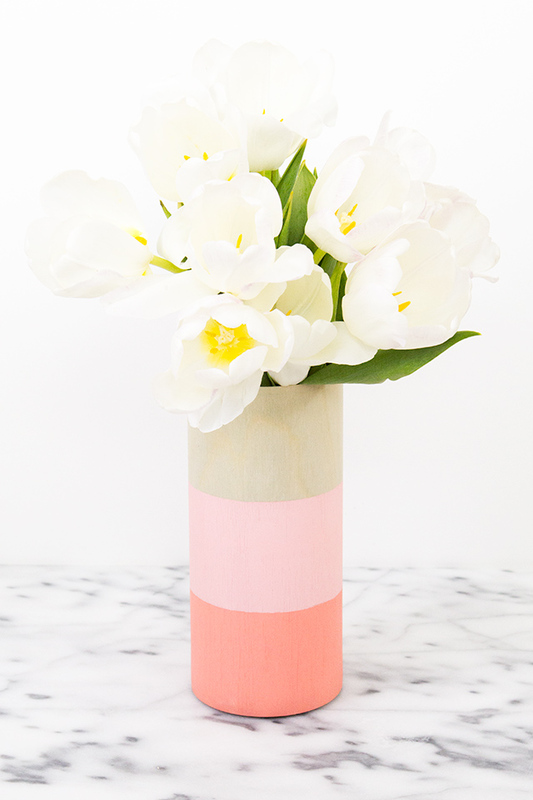 Smooth out any air bubbles with your hands as you stick the wood onto the vase. If you don’t get it right the first time, you can carefully remove the wood sheet but I did find that the areas where the paint was thicker tended to crack when I removed it. 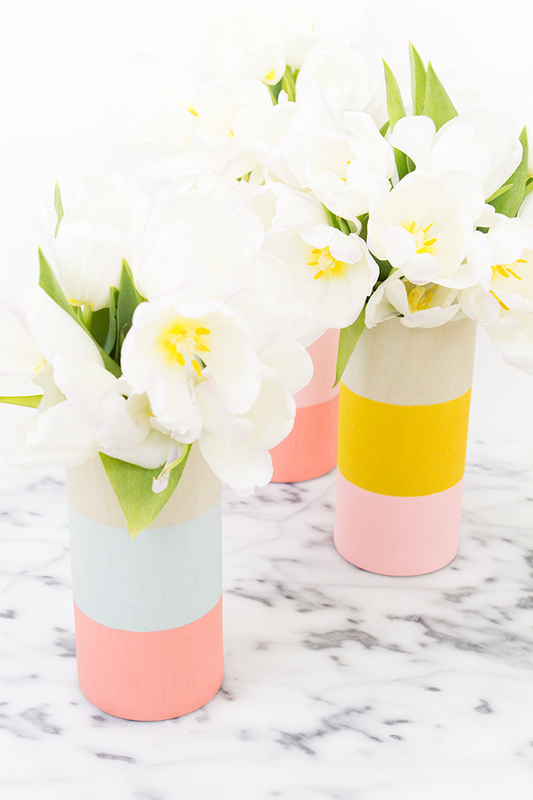 I just love the look of these vases and put them throughout the house. I’m already thinking they would be fun to do another few in just white and gold for the holidays. Never too early, right? I love these! So fresh. I love these! Can I ask what brand of paint you used? The colors are wonderful. Thanks so much! I used the Martha Stewart craft paints in the satin finish. The pale mint color is cloud, the coral is a mix of Camellia Pink and Wild Salmon. The gold color is Craft Essentials in Mustard Yellow. Just wondering what the light pink color is? It’s a mixture of wild salmon and camellia pink with a little bit of wet cement. Looks so elegant really like the idea! !